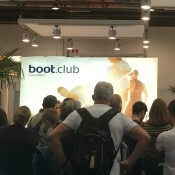 We recently joined water sports enthusiasts and trade visitors from around the world at boot Düsseldorf, and want to share one of our takeaways: the boot.club, the show’s visitor community which has grown to 110,000 members. It was hard to miss the promotion for the boot.club on the website, during the ticket buying process and while we were at the show. We saw substantial marketing for the boot.club across digital and print media, including full page ads in on-site publications. Visitors who signed up for the boot.club received reduced entrance fees to the show in the online shop, access to the boot.club lounge at the show, a free drink and Wi-Fi in the boot.club lounge, an anniversary gift in the boot.club lounge, and year-round exhibitor offers and drawings on boot.club. This reward structure offered immediate monetary savings and other benefits for the current show making it very easy to leverage this in driving attendance and participation in the boot.club program. Longer term benefits can be valuable too but there is nothing like instant gratification to motivate action. When we walked by the boot.club lounge there was a line to get in and large group of people inside so people were certainly taking advantage of this practical, immediate use membership benefit. There was no cost to sign up but you needed to supply some data about yourself, including full contact information, and answer six demographic and interest related questions. This type of marketing program is a win-win! It provides immediate value to visitors and can help show organizers boost brand affinity, drive ticket sales and capture valuable first party data which can be used to better target and personalize attendee marketing.